Whether you are a seasoned runner or new to the sport, you may have some questions or opinions about running on a treadmill versus outside or on an inside track. It is not always safe to run outside and the weather conditions may not allow it. For these reasons, the treadmill is a great alternative. Foot specialists, Drs. Joel Brook and David Northcutt treat runners on a regular basis, keeping their feet in tip-top shape. 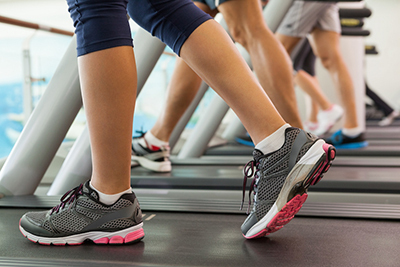 Along with the benefits of treadmill running, there are some risks involved too if you aren’t paying attention to what you are doing or are running improperly. Going full speed ahead – It is not advised that you jump on and crank up the speed immediately. Like any other activity, your muscles need time to warm up. Avoid strained and cramped muscles by easing into your desired speed. Gripping the bars – While the bars can provide stability and security, you should not be running with your hands gripped to them. Doing this alters your form and will not only reduce your efficiency while running but could also lead to neck injuries as it causes you to lean over. Too big of an incline – Adding an incline can increase the efficiency of running on a treadmill but too much too soon can lead to injury. You risk falling off and developing shin splints, arch pain and back problems by inclining too much or too soon. Going past your limits – Pushing yourself too far or trying to out-do the runner next to you in the gym puts your body at risk. Strained muscles, tendonitis problems and sore feet may result if you don’t listen to your body and push it too far. Please let us help you if foot pain is hindering your efforts as a runner. Contact Dallas Podiatry Works at (972) 566-7474 in Dallas, TX or (972) 943-3323 in Plano, TX or request an appointment online.